West Bengal, a state in eastern India, stretching from the Himalayas to the Bay Of Bengal in the south, is a popular tourist destination for its art, culture, history and natural beauty. West Bengal is an agricultural dependent state. Rice and fish are traditional favorite foods. 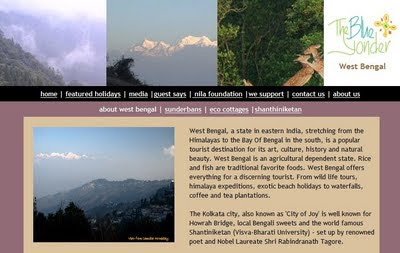 West Bengal offers everything for a discerning tourist. From wild life tours, himalaya expeditions, exotic beach holidays to waterfalls, coffee and tea plantations. The Kolkata city, also known as 'City of Joy' is well known for Howrah Bridge, local Bengali sweets and the world famous Shantiniketan (Visva-Bharati University) - set up by renowned poet and Nobel Laureate Shri Rabindranath Tagore. Near the coastal region is the world's largest delta covered with 10,000 sq.km of mangrove forest, popularly known as Sunderbans. The wild life of of Sunderbans offers a fascinating diversity of terrain, flora and fauna. On the eastern side, lies the Darjeeling, 'Queen of Hills, well known for Sandakfu, the highest peak of the state, Khangchendzonga hill ranges, Tiger Hills and heritage railway station. Kalimpong, Dooars valley and Siliguri are quite close by to Darjeeling city and make the visit a worthwhile experience for nature and adventure sport lovers. With a combination of holidays in nearby Sikkim, we are now offering some unique and of course responsible holidays in West Bengal. Check it out here for more details.